Toronto-based artist John Abrams has hit pause on some of Hitchcock’s most popular cinematic moments and reimagined them into complex and intriguing works of art now on display until February 10, 2017 at The Terrace Theater in Charleston, S.C. The exhibition includes 24 of Abrams’ oil-on-panel movie still paintings and also pairs with the unveiling of a commissioned mural for the outside of The Theater featuring the infamous phone booth scene from The Birds. 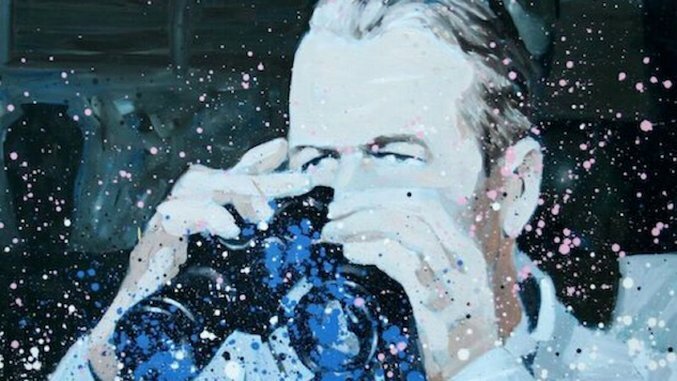 In capturing these moments with impasto brush strokes and strategically placed paint splatter, the artist heightens the voyeurism found in Hitchcock’s films. The artist elaborates on the show further and the meaning behind his works: “Alfred Hitchcock’s cinematic oeuvre has come to occupy popular notions of the psychological thriller. His use of camera movement mimics a person’s gaze, forcing viewers to engage in a form of voyeurism. My paintings translate his film images, in order to interrogate, not only the state of figurative painting, but also the tendency of popular culture to absorb and transcribe film into the realm of everyday life.” We’ve pulled a sample of the works on display.